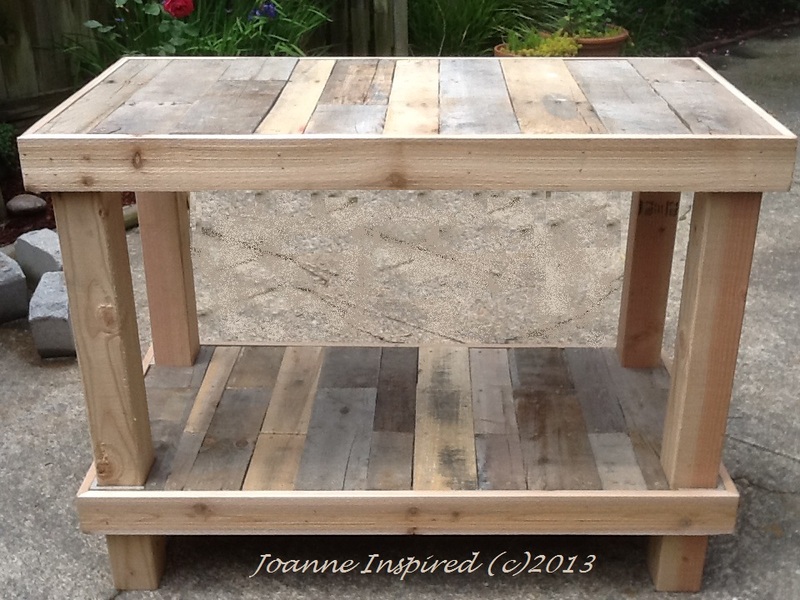 I’ve been itching to create anything with salvaged pallets. My daughter’s kitchen island is finally done. Yea! 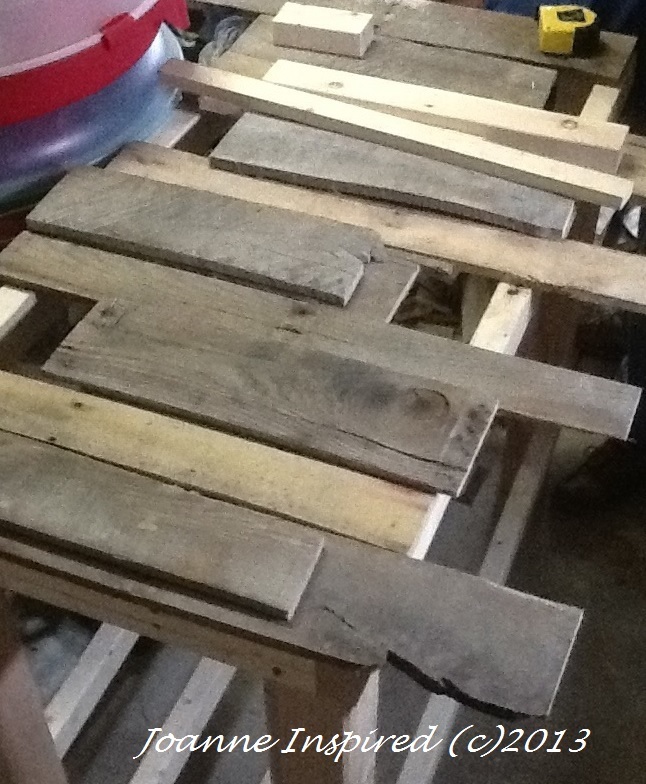 We spent an April Saturday afternoon salvaging pallets. (Read about our Pallet Picking Fun here). 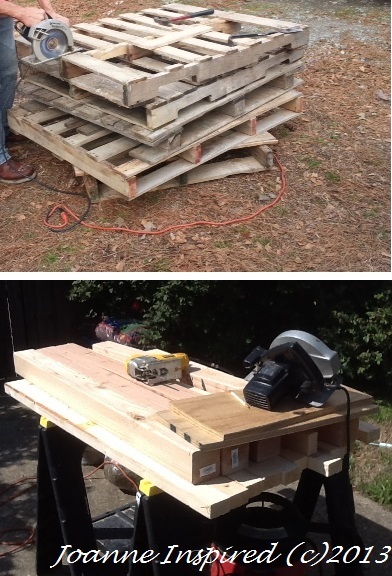 In addition to repurposing the pallets; 4″×4″ posts and 2″×4″ pine strips were purchased. Sorry, the table assembly photos are dark and blurry. We’ve had rain every weekend lately; so this pallet table had to be built in our dark, crammed garage. LOL. Our messy garage is a travesty – please don’t look. First, the pallet boards were laid out, trying to match up the grain and widths in a puzzle fashion. Then, the pallet boards were screwed down. Screws were used so that the table can be easily dismantled and moved. 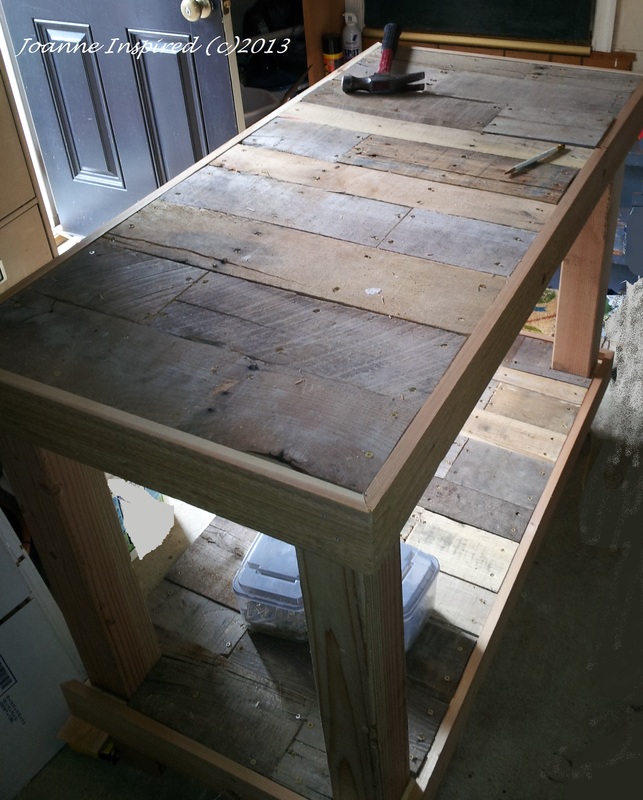 My daughter LOVES her new pallet kitchen island/work table. 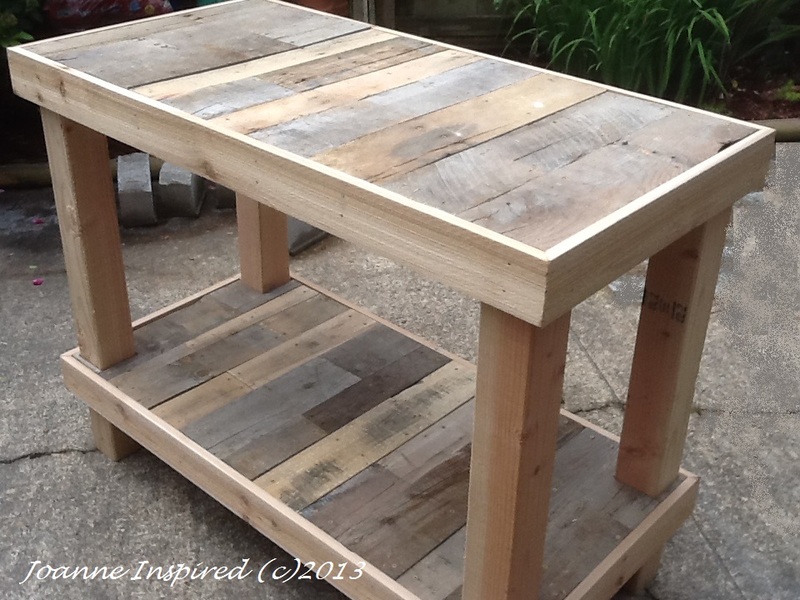 I’d love to know how you’ve repurposed salvaged pallets! Beautiful.. We’re building a pallet shed at our garden, though not as well finished as this! Thank you! I’d like to see your shed when complete – I’ve been looking on Pinterest and other blogs about using pallets in the garden. Oh dang, I love this. Love that you took the time to stagger the boards. So lovely! Thank you! It adds extra storage and work space in our daughter’s small kitchen . She set her microwave on top and stores mixing bowls, baskets of veggies on the bottom shelf. Derrick, Love this nostalgic post. You’ve definitely captured the 70’s flavor. Thank you Joanne. Your post prompted me following you. Joanne – love this project. And I have all the materials in the garage to get rolling on it — question for you: how did you get the pallet boards flush with the pine 2×4’s? is there another board inside the pine boards to rest them on? thx. Thank you for visiting and the compliment! Yes, there are 2×4 (overkill?) “frames” inside/around the four posts at the top and the bottom to rest the pallet boards on. Then, two supports were were added lengthwise to each of the frames (you can see where the screws were added across the top in one of the images). I hope this helps. I’d love to see your completed project. Good luck! Can you tell me how you finished it? I’m making my own and curious as to what finishes will last and be durable while also not toxic for food. Hi, Shawn. She covered the top and bottom shelves with MANY coats of Minwax polyurethane. The pallet wood was extremely rough. She didn’t prepare raw foodstuffs directly on the pallet top, but used mixing bowls and the like. Hope this helps. Thanks for visiting! Can you advise the dimensions of your table? I like the size and wondered how wide and how long the table surface was as well as how tall. Sorry, I did not save written dimensions for this table. I cut the four posts to match my kitchen counter height, 37″ high (approximate). A fame was built around the outside top and bottom of the posts using 2″X4″ pieces, making the table roughly about 24″X60″. The frame width and length depends on how large one wishes their table to be made. So, to answer your question, the table is roughly 37″H X 24″W X 60″L. I wish I could give you better dimensions. I no longer have possession of the table. Take care! Joanne, that is nice! A guy delivering food to a bar and restaurant across the street, dumped four five empty pallets in every alley (2) and parking lot (2) in town last month. I am looking at four outside my window. You know, I know you know, if your daughter put a couple of coats of a good spar varnish on the island, she could wipe it off easier. I love spar varnish. The pallets were rather rough, and still a little “bumpy” after coats of polyurethane. I will let her know about spar varnish. Thanks!